We have a number of highly qualified instructors who are both skilled in teaching diving as well as being accomplished and experienced divers in their own right. All of our theory-based training occurs in our own A/V equipped lecture room, whilst pool work occurs in a local swimming pool. When you need more advanced facilities we regularly arrange training trips to inland dive sites as well as locations on the south coast and further afield. Training isn’t just about learning to dive. Its about having fun. and we believe in continual development, so if you want to test out your latest purchase, or just fancy a bimble around, we have a regular Thursday evening pool session that is open to all members. There are five internationally recognised BSAC diver grades, from the entry level Ocean Diver through to the highest grade, First Class Diver. Each grade allows you to dive safely within your own limitations, at your own pace. New divers generally start with ocean diver,but if you have received training from another recognised organisation then it is possible for BSAC training to start at a higher level. You do NOT need to train with BSAC to dive with us, you can dive under the limits of your previous training qualifications, subject to our Diving Officers approval. If you have always wanted to learn how to dive, this course is for you. This course is for beginners and provides the essential knowledge and skills needed to prepare for open water diving in the UK and abroad. At the end of this course you will be able to dive to a depth of 20 meters, with a suitably qualified buddy. BSAC Sports Diver training builds on the scuba skills you learnt in the Ocean Diver course and helps develop your confidence, skills and experience in the water to allow you to enjoy a wider range of diving sites and conditions. The course builds a sound foundation of open water diving skills and experience with structured, practical lessons. 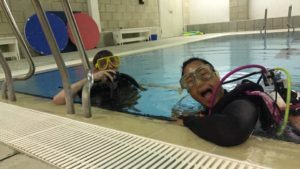 This is a good way of getting more dives under your belt while learning under the supervision of a qualified instructor. Upon completion of this course you will be certified to dive to a maximum depth of 35 metres with a suitably qualified buddy. As a BSAC Dive Leader you are are becoming an expert in your field of dive leadership. As well as being competent in planning and managing groups of divers on the day including, if necessary, managing rescue situations. After qualifying, and if you wish, depth can be built progressively to a maximum of 50 meters. Dive Leaders are eligible to progress to Open Water Instructor and Advanced Diver. This course covers underwater search techniques, diving involving no clear surface (wrecks and similar situations), open-circuit or closed-circuit mixed gas diving, advanced decompression diving and finding and diving an unknown site. The course involves a few classroom based sessions, 2 open water dives and 2 dry sessions. After that, you need to meet a few additional criteria on an on-going assessment to qualify. We run a number of skill development courses in conjunction with BSAC regional coaching teams. Because of our excellent facilities a number of their courses are run in our own clubhouse.